We can therefore see that the very nature of this Holy Book is to use the method or formula of equating & identifying every idea with its opposite in order to be free from both. In this way, “one can withdraw oneself from the whole sphere of the Ruach,” by which he means the conceptual mind. It is this conceptual mind that limits our perception through its inherent duality, obscuring and veiling the “higher” aspects of the Soul that are, in Qabalistic terms, “above the Abyss” (Yechidah, Chiah, and Neshamah which are 3 names or aspects of 1 thing). This same formula is mentioned in another Holy Book, Liber Cordis Cincti Serpente sub figura LXV, when it is written “Also he taught me the holy unutterable word Ararita, so that I melted the sixfold gold into a single invisible point, whereof naught may be spoken” (LXV, V:15). Interestingly, the word “Ararita” is not capitalized and is used as a word in itself here, rather than being simply a Notariqon. 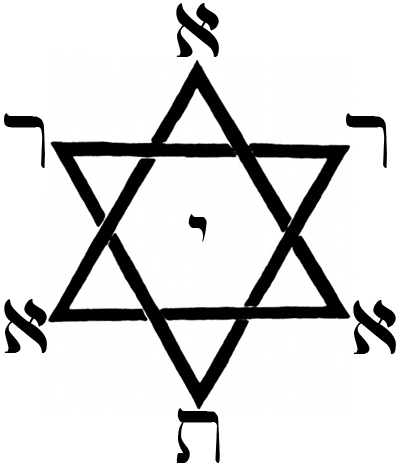 Further reinforcing this idea is the fact that the letters of ARARITA can be arranged around a Hexagram with the Yod (the “I” in ARARITA) in the center. This is the “single invisible point” that is mentioned in Liber LXV. Also, the letters form a symmetrical arrangement that mirrors the idea of equating and identifying each idea with its opposite, which is the nature of the formula of ARARITA. This symbol has many other meanings and interpretations which you may divine by your own ingenium. Other information: At the beginning of this text is a note which reads, “The full knowledge of the interpretation of this book is concealed from all. The Philosophus must nevertheless acquire a copy and thoroughly acquaint himself with the contents. He must commit one chapter to memory.” It is therefore assigned particularly to the A∴A∴ grade of “Philosophus,” attributed to Netzach on the Tree of Life and sometimes designated by the title “4=7.” Also, the phrase “the full knowledge of the interpretation of this book is concealed from all” may refer to the fact that “knowledge” is the “false Sephirah” known as “Da’ath,” which is the crown of the Ruach. We already have seen that this Book contains a method whereby one transcends the Ruach entirely, therefore it is not possible to have “full knowledge” of it, insofar as this knowledge refers to the knowledge of the Ruach. It is usually called “Liber 813 vel Ararita” or “Liber Ararita” by Crowley. ARARITA: ARARITA is a “Notariqon” which is essentially a Qabalistic acronym. Each letter is the first letter of a word in the Hebrew phrase “Achad Rosh Achdotho Rosh Ichudo Temurato Achad” that Crowley translates to mean “One is His Beginning; one is His Individuality; His Permutation One.” The very first line of Liber ARARITA is “O my God! One is Thy Beginning! One is Thy Spirit, and Thy Permutation One!” which is another translation of sorts of the phrase ARARITA. 570: The reason this Liber was, at least at some point, “sub figura 570” is still a mystery to me. In “Liber 207: A Syllabus of the Official Instructions of the A∴A∴,” Crowley gives the rationale for assigning certain numbers to certain Libers, but there is a conscpicuous blank next to “DLXX” (570). This Holy Book has 7 chapters, each corresponding to one letter of the word ARARITA. Each chapter has 14 lines, the first line numbered as 0, and the rest numbered 1 through 13. Therefore, there are technically 98 lines total, but it is most likely that the lines numbered 0 are supposed to be excluded from the total number of lines for reasons that will become apparent. Excluding the lines marked as “0,” there are 91 lines total, the number of “Amen” and the mystic number of 13 (Sum of 1-13), which Crowley says is “The Mystic Number of Kether as Achad” (Kether is the 1st Sephirah on the Tree of Life, which means “Crown,” and “Achad” is a Hebrew word that means “Unity” which enumerates to 13). Because the 7 chapters all end with the “13th” line, and because of the connections of this number to 91 (being 7 * 13), it is most likely that this Book has, at least symbolically, 91 lines. In general, then, the 7 chapters follow several patterns, including each one being attributed to a Hebrew letter of the word ARARITA, each having 13 lines (a “0” line and lines 1 through 13), and each being part of a greater method as described by Crowley in the 22nd Aethyr. The “upright” ideas that correspond, verse by verse, with the “averse” ideas in Chapter II, the following chapter. The “averse” ideas that correspond, verse by verse, with the “upright” ideas in Chapter I, the preceding chapter. 813 is the sum of the 3 great numbers of the magick square of six.